COLLINSVILLE, three hours drive south of Townsville in northern Queensland, is a town in transition. With a population of just 1500 people, coal-rich Collinsville was built on mining. 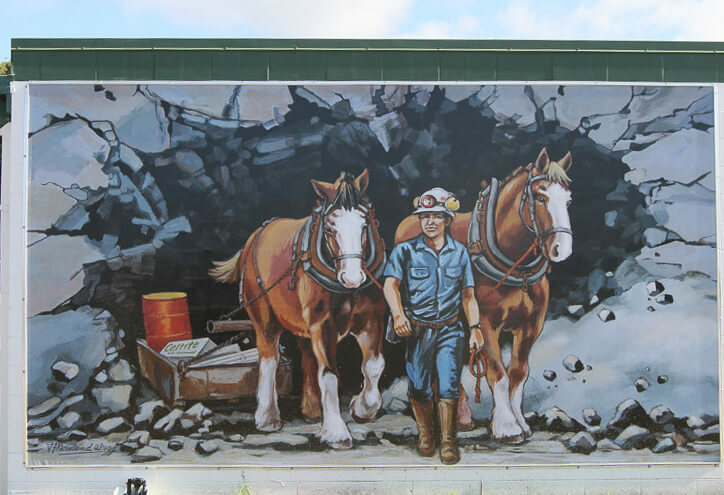 The township is proud of its heritage, celebrating scenes from the past with murals and a bronze pit pony welcoming those passing through. Coal is still being mined around the small country town, but in a sign of the times, a new industry is emerging – solar. Sitting just outside of town on the footprint of the old Collinsville Power Station is the new 42.5MW Collinsville Solar Farm. 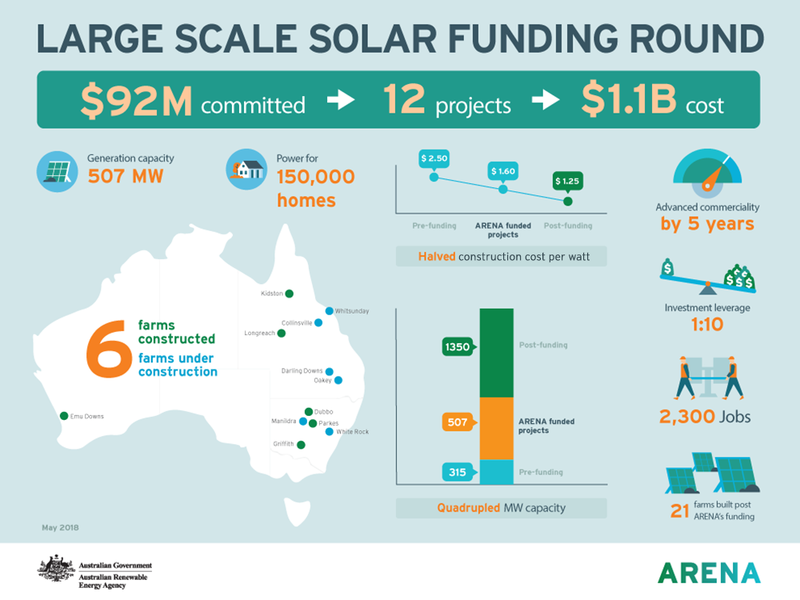 Built with $9.5 million from ARENA, the Collinsville Solar Farm is one of the 12 large scale solar farms supported by ARENA’s $92 million large scale solar funding round. All of the “clean dozen” are now either completed and commissioned, or under construction and expected to open this year, where they will collectively deliver 450MW of solar energy into the grid in three states. Six of the 12 are in Queensland. Nowhere is the boom more evident than here. According to Powerlink, there are 150 potential projects seeking connection to the grid, totalling a staggering 30GW of generation across Queensland. According to the Clean Energy Council, nearly half of all large scale solar activity is taking place in the Sunshine State. At the heart of this solar boom is Collinsville – dubbed the state’s “solar hot spot” for its 300-plus sunny days a year – where there are a further five solar farms planned or under way. 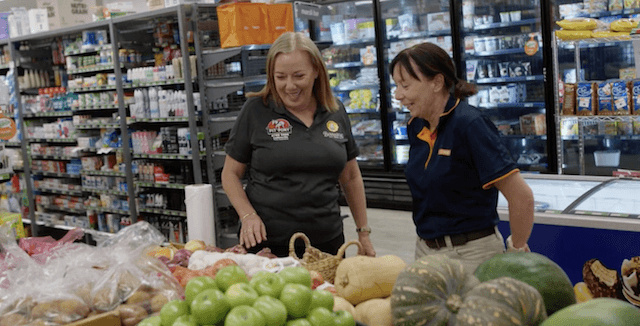 Another of the 12 projects to receive ARENA funding is Wirsol and Edify Energy’s 57.5MW Whitsunday Solar Farm, located just across town, which received $9.5 million. Two years ago, ARENA set out to bring down the costs of building solar farms with their funding round. ARENA CEO Darren Miller says the numbers show that the funding round acted as a catalyst to kickstart the industry. “Prior to ARENA’s funding round construction costs were $2.50 per watt, which today has reduced to just $1.25 per watt,” Mr Miller said. “As well as the 2300 jobs created by these 12 solar farms, a further 21 projects have been delivered since. “A few short years ago large-scale solar didn’t stack up, now AEMO tell us there is 10GW of capacity in the connection pipeline,” he said. Today, federal government funding is no longer needed to support large scale solar farms which are popping up across the state. Building four solar farms in quick succession has delivered a boost to the local economy. Owner of the Pit Pony Tavern (named after the iconic horses that dragged coal from the mines) Janet Lobegeier says she has seen the local economy surge since construction started on the solar farms. “Employment has grown. They put people into the houses, feed people in the hotels, buy petrol at the petrol station. They’ve sponsored our local rodeos, they’ve sponsored our schools. They’ve made sure that they’ve employed locals first,” she said. “As they’ve got bigger out there, the town has got busier,” she added. The investment in construction has created thousands of jobs. At a count in late 2017, there were 6800 people working on solar and wind in Queensland – the most of any state. The surging solar industry is a big factor in the jobs boom, contributing to the renewable energy workforce doubling in size during 2017 alone. A local Bouygues worker on the Collinsville Solar Farm said that he has seen the benefits first-hand. “A lot of the local people that I’ve talked to in the community are very excited about having renewable energy so close to them,” he said.